•Please call or email the shop if you wish to pay by VISA, MASTERCARD, MAESTRO, PAYPAL, Bank transfer. 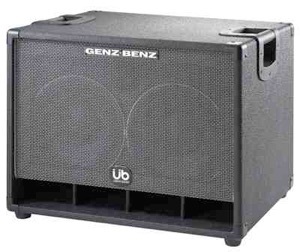 The UB series features classic design, powerful tonal output packaged into lightweight touring cabinets finished in a black “nubby-textured” vinyl and a silver/ black wire mesh grille cloth. Whether the music calls for the clarity and response of slap-style, the grunt and growl of pick playing or the warmth and punch of finger style, the UB series delivers. Each cabinet is loaded with the GNX10250 loudspeaker, compression tweeter and custom designed crossover network with a 100 watt tweeter level control. The latest addition to the UBER series, this 2 x 12” design delivers the punch and character of our cast frame Neodymium GNX12300 loudspeaker. Impressive output and tonal clarity are matched with the classic styling and lighter weight cabinet designs of the UBER series. The 12” loudspeakers are blended with our compression bullet tweeter and 18 db crossover which provides both Speakon® and ¼” connections and a tweeter level control. A more "Old School" tone compared to the Neox 212T. Dimensions HxWxD 28" x 24 1/4" x 18 1/4 "
Thanks for the help and advice you gave both before and during checking out the GB amp/cabs. Having shopped in many, many music shops over the years it was a pleasure to meet someone who was knowledgeable, welcoming and amazingly helpful. The Streamliner is an awesome piece of technology ( so much "ooommph" in so compact a package ) and the Uber bass 212 sounds simply immense. The perfect combination for my playing needs. Now to start saving up for a Mike Lull T-bird to go with my Gibson LOL. Used the cab Friday night with my GBE750 Wowwwwwww!! The first thing the sound man @ the venue said to me was " we do have a PA you know " to which I replied I've bought my own, which tickled him. He went on to say that he has not heard a better sounding bass rig in all his days as a sound engineer. An awesome almost old school sound and a formidable volume available with plenty of headroom. My Jack Bruce and Andy Fraser tone was still there with the tube preamp overdriving nicely. Only downside was my guitarist saying he felt like a megalomaniac with his Marshall stack, but I’m sure he’ll get used to it. Suggested I bought an extra 115 to make it bigger and not commect it, expensive riser if you ask me………! Thanks again Mark and if I can sell the spare Gibson SG Bass I may just take the Thinderbird !!! After many years lugging my beloved Marshall stack and then the heavyweight VBA rig Mark convinced me to try a number of "lighter" alternatives. The sound in our heritage rock band www.theproperboys.co.uk is old school and the Streamliner and my old Gibson EB3 nails the tube overdrive so loved by Jack Bruce and Andy Fraser. Downside is my guitarist thinks he now looks like a megalomaniac and my gear looks too small.........small price to pay.......check us out on YouTube. Mark knows his gear and it is a pleasure to spend time in the shop knowing that you are getting good advice and keen pricing ..........now do I need the Uber 4x12 as well? The latest addition to the UBER BASS line of premium bass cabinets is our first compact 15" and tweeter, bass enclosure. Small in stature but extremely powerful in output, the GB 115T-UB is for those players looking for a more traditional "old school" flavor. This cabinet delivers nice, big and round bottom while retaining definition, even for players moving back to flat wound strings. This 500 watt, 8 ohm cabinet also provides an excellent foundation when used with other UBER models, such as our GB 210T-UB or the new UBER QUAD. As part of the UBER BASS series the cabinet features our distinctive "nubby" vinyl along with our classic grille and silver piping, Edge-Lift handles, Speakon® and 1/4" inputs, 100 Watt Tweeter Level control and our 18 db/octave crossover. 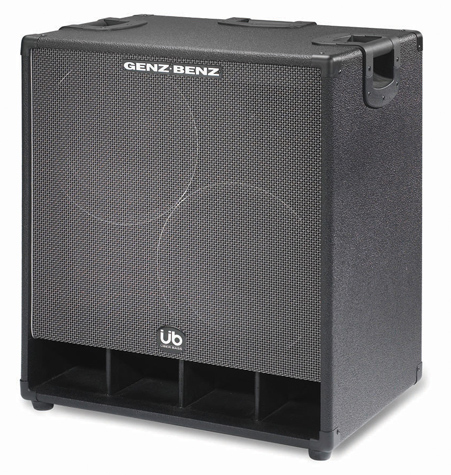 Dimensions HxWxD 23" x 24 1/4" x 18 1/4 "
Designed to the same demanding specifications and response characteristics as the larger UBER models, the new 2 x 10" and tweeter cabinet delivers the dynamic UBER tone in the smallest possible cabinet design. It features our cast frame GNX-10250 Neodymium loudspeaker and compression bullet tweeter. The input panel provides both Speakon® and 1/4" connections and a tweeter level control. Available in 8 ohm impedance only. 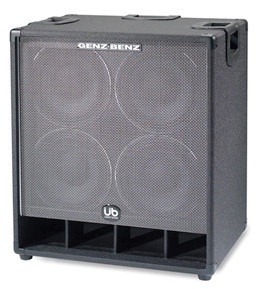 Dimensions HxWxD 20" x 24 1/4" x 18 1/4 "
The UB series features classic design, powerful tonal output packaged into lightweight touring cabinets finished in a black “nubby-textured” vinyl and a silver/ black wire mesh grille cloth. Whether the music calls for the clarity and response of slap-style, the grunt and growl of pick playing or the warmth and punch of finger style, the UB series delivers. Each cabinet is loaded with our GNX10250 loudspeaker, compression tweeter and custom designed crossover network with a 100 watt tweeter level control. This design offers 1000 watts of output in a compact, easy to transport enclosure. The Edge-Lift handles, rear-mounted casters and rear skid rails make it a breeze to get this 72 lb. cab from stage-to-stage. 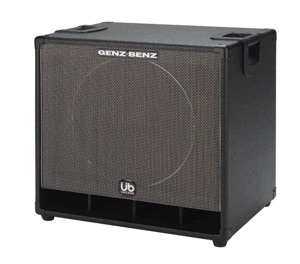 The cabinet is also available in an 4 ohm version (GB 410T-UB-4). "The UBER QUAD"- named after it's unique, four speaker design. This compact, "multi-driver" cabinet features 4 separate drivers of varying sizes, which produce an incredible 3 dimensional tone. This multi-driver cabinet is excellent for bassists using "extended range" 6 and 7 string instruments. It has a signature tone however, that is ideal for any bassist looking to add a new element of depth, warmth and clarity to their tone. The all important mid range is handled by the dual 8" Neodymium speakers in separate, sealed internal enclosures providing thick, tight, warm mids without "honk" or harshness. These separate chambers are extremely compact which enhances the response and tight suspension of the driver's mechanical performance. 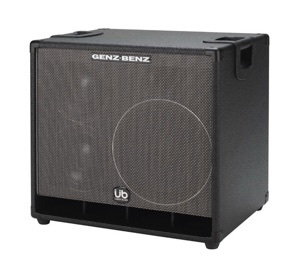 This 600 watt 8 ohm cabinet sounds great on its own but can be an impressive stack when using 2 UBER QUADS or when stacked with our new GB 115T-UB. 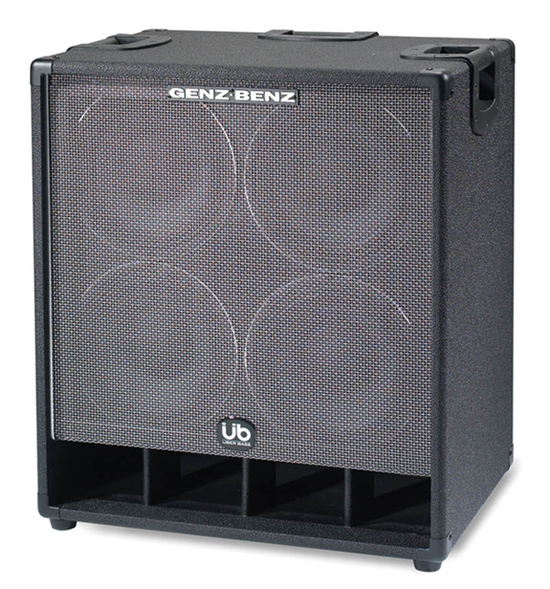 As part of the UBER BASS series the cabinet features our distinctive "nubby" vinyl along with our classic grille and silver piping, Edge-Lift handles, Speakon® and 1/4" inputs, 100 Watt Tweeter Level control and crossover design based on a combination of electronic and electro-acoustic principals. This yields a combination of crossover slopes that result in smooth multi- dimensional composite acoustic response. All prices are current and are subject to change and include UK VAT. If you are purchasing from outside the EC (European Community) we can deduct the VAT from your items.